Direct-Operated Regulators are used for controlling pressure and temperature in a variety of applications. Watson McDaniel offers several self-contained pressure reducing valves for use with Steam, Water, Oil and other liquids & gases. 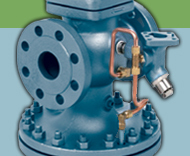 The O Series Pressure Regulators are designed for use with Steam, Air, Water and other liquids. These valves can regulate outlet pressure in the range of 0-200 PSIG, depending on the selected spring. Max inlet pressure is 250 PSIG. The B Series Pressure Regulators are designed for use with Water, Oil, Air and other liquids & gases. These valves can regulate outlet pressure in the range of 1-125 PSIG, depending on the selected spring. Max inlet pressure is 250 PSIG. The 455 Series are balanced, Externally-sensed Pressure Regulating Valves and are used for reducing pressure in Steam, Air and Water systems. These valves can regulate outlet pressure in the range of 1-125 PSIG, depending on the selected spring. Max inlet pressure is 250 PSIG. Externally-sensed regulators are often more accurate than internally-sensed regulators because the sensing line is connected close to the process it is intending to control and is far enough away from the outlet of the regulator to not be affected by turbulence. The 402 & 403 Series are Internally Pilot-Operated Pressure Regulating Valves and are used for reducing pressure in Steam and Air systems. These valves can regulate outlet pressure in the range of 0-280 PSIG, depending on the selected spring. Max inlet pressure is 250 PSIG for the 402 Series and 450 PSIG for the 403 Series. Back Pressure/Relief Valves are used to maintain a specific back pressure or to protect systems from an over-pressure condition. Watson McDaniel R-Series & 10691 Series Back Pressure/Relief Valves are designed for low-capacity liquid service (< 20 GPM). The R-Series can be used at set pressures in the range of 1-300 PSIG, depending on the selected spring. The 10691 Series has a soft EPDM seat for tight shut-off and can be used at set pressures of 5-300 PSIG, depending on the selected spring. Watson McDaniel 3040 Series Back Pressure/Relief Valves are designed for liquid and air service. They can be used at set pressures in the range of 1-125 PSIG, depending on the selected spring, and capacities up to 278 GPM, depending on the valve size.